Get Spring ready with new season fashion & beauty picks from Debenhams! Good morning! I hope you are all enjoying the lovely weather that we are currently having? With this change of weather in mind, today I am bringing you my new season fashion & beauty picks, all of which are currently available in Debenhams. Spring sees us shed the cosy jumpers, coats, heavy foundation and dark lips that we've worn in favour of lighter everything - fabrics, skincare and base products! I'll start with fashion and the easiest way to update your wardrobe is to add some floral items of clothing. 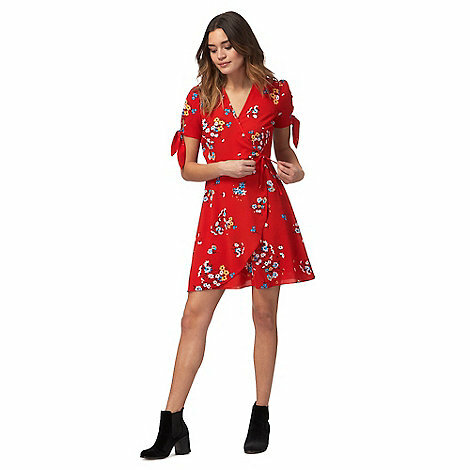 I love this Red Herring Red floral print wrap over tea dress because I find wrap dresses to be very flattering, plus this dress can be worn both during the day and evening, paired with ankle boots and a denim jacket or ballerina pumps for a more feminine look. 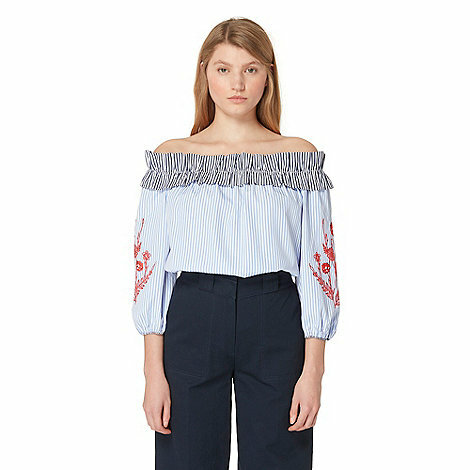 I love bardot tops and this Studio by Preen Blue Striped Embroidered Bardot Top is perfect for Spring - it combines this season's ruffles with embroidery and I think it would be perfect teamed with skinnies or white jeans on sunny days! If full on floral isn't your thing, then the embroidery trend might be for you as it is a nod to floral trend but on a plain background, which some may find easier to wear. 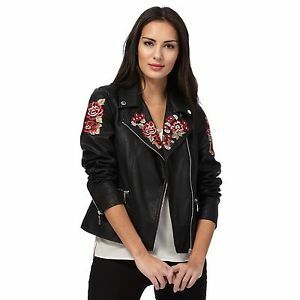 I love this Star by Julien Macdonald Black rose embroidered biker jacket because it is so versatile - it would work with both dresses and jeans. The embroidered rose detail is on the sleeves and the lapels so it isn't too over-powering but it would definitely dress up an otherwise plain outfit. 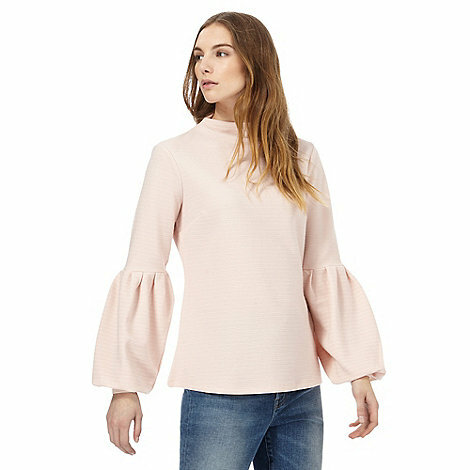 The trend that I am most excited about this season is statement sleeves and this Nine by Savannah Miller Light Pink Balloon Sleeved Top is perfect. This shade of pink is everywhere this season and I am going to buy this to wear with pale grey skinny jeans. Moving on to beauty, there are so many trends this Spring - from dreamy and dewy skin (my favourite all year round) and non-touring (using a sheer base and highlight but no contouring) to the complete opposite trend of look at me lips (hot pinks and fluro-brights) and '80s revival (neon lips and blue eyeshadow/liner). 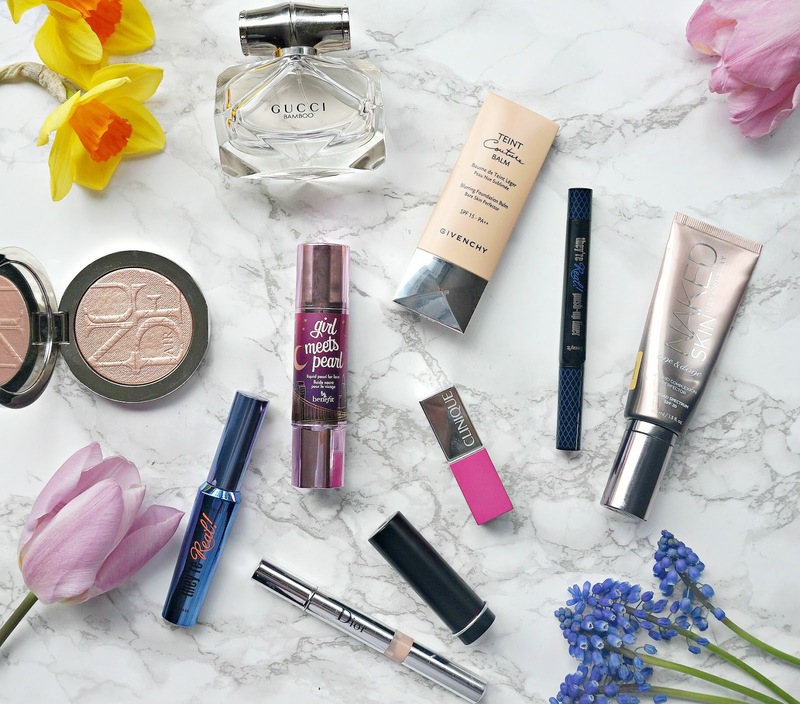 I have put together a selection of products that can be used to create some of these looks, which I hope will help if you are looking to update your makeup bag for Spring! The perfect Spring base is lightweight and a tinted moisturiser is a good option - Urban Decay Naked Skin One & Done is one that I fell in love with last summer. It feels weightless on the skin, yet provides light-medium coverage and has skincare benefits too. My current love is Givenchy Teint Couture Blurring Foundation Balm, which is amazing! It blurs my fine lines and pores, smooths and hydrates the skin, is so lightweight and looks really skin-like - it's honestly like magic! I don't know why this foundation doesn't get more hype because it gives the perfect dewy, healthy finish to the skin. Either of these bases would work well for the dreamy and dewy skin and non-touring looks, and although I'm a highlight addict, the trend doesn't lend itself to the discoball effect! A natural, luminous highlight can be achieved with Dior 'Backstage Pro Flash Luminizer' which is very similar to YSL Touche Eclat or Benefit Girl Meets Pearl Liquid Lighlighter, which gives the skin a very luminous finish. Liquid highlighters are perfect for the dewy skin trend. 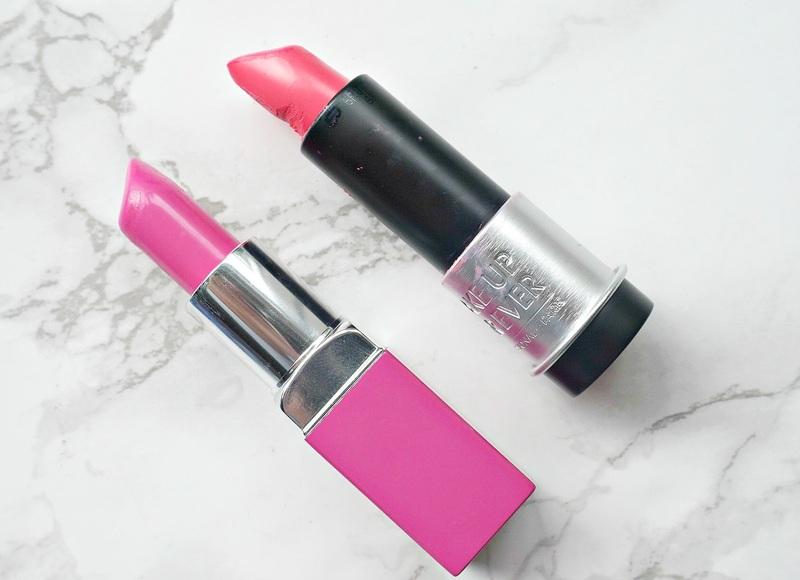 For look at me lips, my picks are Clinique Wow Pop - a bright pink from the Clinique Lip Pop range that also primes the lips and is so comfortable to wear and Make Up For Ever Artist Rouge Créme Lipstick in the shade C305 - beautiful vivid coral. 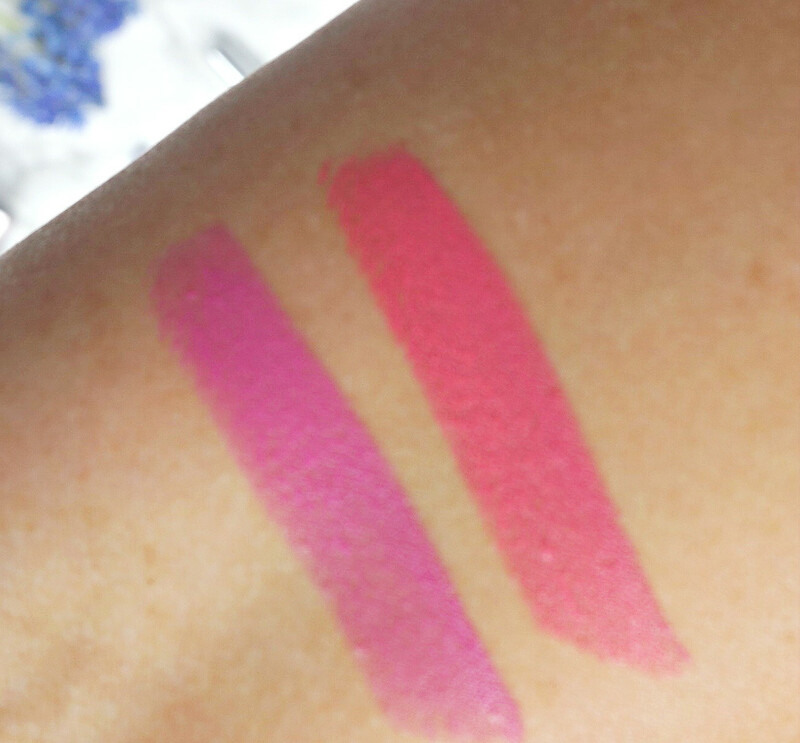 Both of these lipsticks are cream formulas so they won't dry the lips out, both are extremely pigmented and both last around 4 hours on the lips before they need to be reapplied. The '80s revival trend is the one I would find most difficult to wear so instead of going for a full-on frosted blue eyeshadow look, a wearable nod to the trend can be achieved with a coloured mascara and eye liner. 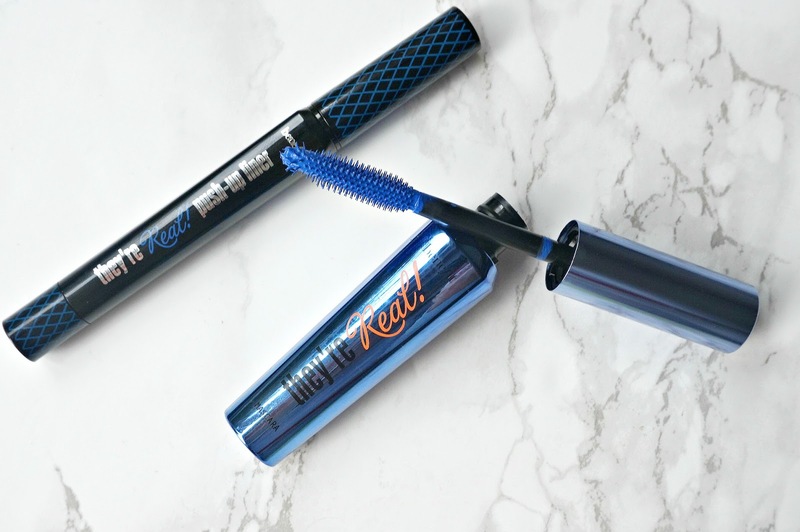 The Benefit They're Real Beyond Blue mascara and Benefit They're Real Push Up Eyeliner are perfect to achieve this look without looking like Madonna circa 1985! Are you interested in any of these fashion or beauty trends? I would love to hear how you would incorporate them into your wardrobe and makeup collection! Please tell me in the comments below which one caught your eye the most? All products are bought by me, unless otherwise stated. In this case, Debenhams sent me a gift card & I used it to purchase a foundation and highlighter, which are featured in this post. I bought everything else. This post is not sponsored. Opinion is always my own.